This has been by far the most difficult undertaking up till now. I know I keep saying that but its true. It’s the opening track on the debut LP and it was a great way to introduce yourself to the album buying public. It was co-written by Howard Devoto and John McGeoch , respectively one of the greatest post-punk lyricists and one of the most underrated musicians these lands have ever produced. John’s work elsewhere outside of Magazine resulted in the best songs of other bands ever recorded by bands such as Siouxsie & the Banshees and PiL and yet on this track it is the keyboard playing of Dave Formula and the bass notes of Barry Adamson that really make this tune so memorable. It’s a perfect example of how Magazine, while made up of amazing individuals, really were the sum of those talents. The band’s third album is rightly lauded as their finest moment with not a duff songs amidst its ten tracks. Indeed it crossed my mind just to feature the album in its entirety as the contribution to this series and leave it at that (see….this is a posting that really has had me thinking!!!). The Correct Use Of Soap is an unusual album for the fact that it closes with its strongest and most memorable song when the rule of thumb is that you put those first or at a point when you perhaps think it is time to bring a ‘wow factor’ back when things are flagging. Thirty five years on, Floorboards remains a piece of music that has the ability just to stop me in my tracks when it kicks in. And the opening couplet, which I’m told by literary loving friends is derived from the opening lines in a Dostoyevsky novel, remain my favourite lines in a song of all time. I even have the t-shirt. PS : Think of all the songs in the history of pop music that have made the singles charts and then join me in being bewildered that this didn’t crack the Top 75…. I have never quite understood the attraction of Captain Beefheart and outwith one song on a compilation album I have nothing within what most folk would describe as a very extensive and eclectic record/CD/cassette collection. And yet I adore Magazine’s take on a song that originally featured on the 1970 album Lick My Decals Off, Baby. The simple explanation is that the cover sounds nothing like the original as Howard & co deliver what I feel is the perfect blend of punk and glam rock with its catchy riffs and sneering delivery complete with additional lyrics from the angry, ill and ugly as sin protagonist to get the message across. The track that helped me get over my first seriously broken heart. I didn’t want to turn around and find that I’d got it so wrong. I had stepped into the deepest unhappiness and while I wasn’t sure if I had ever got to know her I could say in all certainty that she never ever really knew me. It’s very rare for new wave/post punk acts to nail a ballad in a way that it could be held up as being among their best songs, but Magazine, aided by an achingly beautiful backing vocal from Laura Teresa, pull the trick off with aplomb. The ‘difficult second album’ syndrome affected Magazine in that Secondhand Daylight is a fair bit away from any sort of post-punk sound and at times seems to steer awfully close to prog rock. And yet, it was only in subsequent years as the new wave of synth bands emerged from their bedsit rooms, did we all come to realise that much of Secondhand Daylight was ahead of its time, although I’m still not sure about The Thin Air which is a four-minute instrumental that is more or less a John McGeoch saxophone solo (albeit I was fond of including it on compilation cassettes that were designed to be played with the lights dimmed or even totally switched off whenever my girlfriend was in the room with me – she adored sax). Permafrost is perhaps the ultimate in sneering creep vocals that Howard Devoto seemed to specialise in at the time….its suggestion of taking revenge on an ex-lover in a very unambiguous way meant that this never stood any chance of ever making it onto any smoooooth compilation cassette. One of the ideas behind today’s compilation is that you can play either side and you have a classic side of vinyl in your hands. That’s why I don’t have a Side B but instead am going for a Double-A side album. This is the song which opened ‘Soap’ . It immediately indicated that it was going to be an LP with a pace, energy and sound that was a lot different from its predecessor with the band seemingly returning to the punkier new wave rifts and leaving other bands (e.g. Simple Minds) free to explore, develop and deliver the synth based Art/Krautrock side of things. It’s also one of the finest demonstrations of just how great, and I mean GREAT, a guitarist the band had. The idea of Magazine making a new album after a gap of 30 years was worrying. 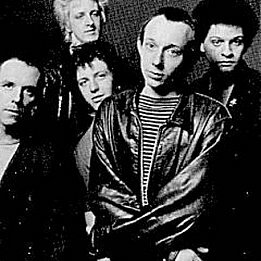 The comeback gigs had been triumphant and in Noko (who had worked closely with Howard Devoto in Luxuria in the late 80s) they had someone with the ability to fill the very big boots of the late John McGeoch who had sadly died in 2004 at the young age of 48. But the idea of new songs was, as I said worrying. No Thyself is an album that, for the most part, dissipates those worries. It is certainly a superior effort to 1981’s Magic, Murder & The Weather which was recorded at a low point with McGeoch having left to pursue alternative options and Devoto depressed by the failure of ‘Soap’ ; fans and critics alike were of the view that it had been a sad way for the band to initially bring their recording career to an end. The ‘comeback’ album had a lead-off single and the most immediate thing was that it sounded as if McGeoch was playing on it…it really is uncanny. It’s a tune that wouldn’t have sounded out-of-place in their pomp and heyday and to this fan highlights just how ahead of their time they really were. The lyric meanwhile, is biting and savage and just a tad controversial. At least we know Howard has no intention of topping himself…..
One of the great post-punk anthems, the debut single had the audacity to reach #41 in the singles charts and somehow trigger off an appearance on Top of The Pops. The sight of Howard & co obviously frightened everyone concerned for instead of it climbing into the Top 40 the following week thanks to being exposed to millions of viewers/listeners it dropped like a stone. The band never got near the singles charts again despite releasing a run of cracking 45s over the next three years. The album version of the song is marginally different (the thing most noticeable is that each chorus of the single begins ‘Shot, Shot by both sides’ while the LP is simply ‘Shot by both sides.’ It’s a tune co-written with Pete Shelley who loved it so much that he used it for the track Lipstick some ten months as the b-side to the hit single Promises but rather naughtily didn’t give Howard a writing credit………. Magazine didn’t do too many covers but when they did it wasn’t in any half-hearted or lazy way. It was inconceivable for a post-punk band to do a take on a #1 soul single from 1970 far less for them to make it sound as if it was a post-punk piece of music. The band and the label knew they had something special here and released it as a single in March 1980 hoping, forlornly as it turned out, for greater success than ‘Floorboards’. It would subsequently appear on ‘Soap’ a few months later and become a firm favourite among fans, but it was only in 2000 that most of us got to hear the Peel Session thanks to the release of a 3xCD box set (unless of course we had been paused over the pause button when it had been broadcast in 1979 as part of a session promoting songs from Secondhand Daylight). A classic album should ideally end with a song that makes you want to flip it over and listen to the whole thing again. This does exactly that……. It will always have a special place in my heart as it was the first song I ever heard Magazine perform in a live setting when I went, with Mrs Villain, to see them in Manchester in February 2009. There are tracks missing from this compilation that I can’t believe I’ve left off. I know I haven’t chosen my favourite ten Magazine songs but I feel what I have done is completely in the spirit of this particular series. Damn. I probably would have just listed the entire contents of The Correct Use of Soap. Then again, the Best Song Ever In The World is the 7″ version of ‘Rhythm of Cruelty’. Is everyone else taking these imaginary comps personally, or am I crazier than I previously thought? I looked at the title and correctly guessed what the first two tracks would be, as they would have been my first two. Permafrost is a great closer for Side 1, too. I’m sure we can all offer alternative tracks, but I think you’ve come up with well-balanced selection. A tough one! Well negotiated. I would have gone for the BBC version of I Love You, You Big Dummy over the b-side take, but other than that, can’t fault the choices. I also saw them for the first time in Manchester in 2009 (Valentine’s Day I recall). A great gig, but wish I’d had the chance to see them with John McGeoch. His playing never fails to astonish me (surely no coincidence that The Correct Use Of Soap and The Banshees’ Juju are two of my all-time fave albums). I’ll be playing a track from The Correct Use Of Soap at Glossop Record Club’s Tony Wilson Night this week – https://glossoprecordclub.wordpress.com/2015/08/11/septembers-record-club-tony-wilson-night/. There are many Wilson connections I’m sure, but the ones I’ll be highlighting are Martin Hannett as producer and Howard Devoto’s brilliant cameo in 24 Hour Party People. Any excuse to get some Magazine on the agenda! Put in Back To Nature for Hello Mr Curtis and that works for me! Afraid I never did get on with the comeback album, although the gigs were great. Whilst reading the post I was about to write a very long reply, telling you how wrong you got it all, but then I realized I don’t have the slightest clue how to improve on that: it really is impossible to nail it down to 10 songs only with Magazine! But, as Jonny said, ‘Rhythm Of Cruelty’ is a must and that’s for sure! Simon….It was only after listening again to both versions of Big Dummy after finishing off the piece that I realised I should have gone with the BBC version of that song and the studio version of ‘Thank You’ instead of the BBC version. I’ll hold my hands up on this one….. Listened to this via Spotify. Decent selection and fits on one side of a C90! Picking a best of Magazine is almost impossible, but I reckon I’d tend to agree with pretty much all of yours! Blimey this is a great listen, though I do kinda miss ‘Rhythm of Cruelty’ too. A hidden bonus track? looks like all the links are gone? any chance of reactivating?